The Suan Pakkad Palace Museum was the former palace of Prince Chumbhot and his wife Mom Rajawongse Pantip. The Palace was converted to a museum in 1952 under the management of the Chumbhot-Pantip Foundation. 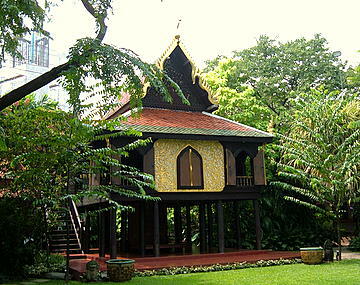 The original museum consisted of eight traditional Thai houses dismantled and rebuilt in the present location. The houses are linked by corridors and give the impression of a single structure. 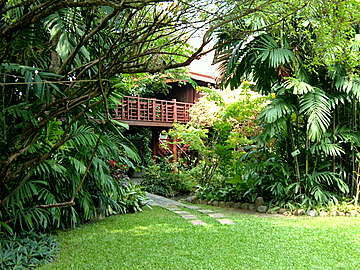 Suan Pakkad means cabbage garden, as the area was formerly popular for Chinese cabbage farming. Paradoxically, the centerpiece of this palace museum is the newest addition built in 1996 to display the ancient Ban Chiang collection. This rare collection of artifacts dates back to 3,600 BC – 200 AD ranking Ban Chiang with civilizations in ancient Egypt, Stonehenge and the Indus valley. 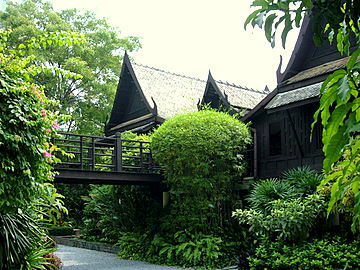 The Ban Chiang Collection in the Suan Pakkad Palace Museum is a display of rare artefacts from the Ban Chiang settlement. Ban Chiang was a prehistoric, agricultural settlement in the province of Udon Thani in northeastern Thailand from 3,600 BC – 200 AD. The Ban Chiang prehistoric site stands among the ancient Egypt, Stonehenge and the Indus Valley civilizations. It's considered the most important prehistoric site in South-East Asia. In the early years, 3,600 BC, the settlement engaged in rice cultivation and husbandry. Later came the development of ceramics, bronze and iron production. The artefacts consist of bronze tools and implements, painted pottery, glass beads, necklaces, bracelets and stone earrings during that period. 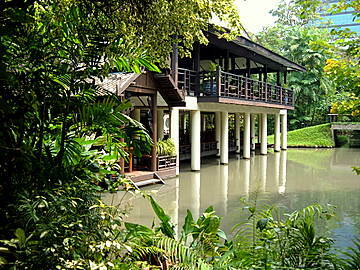 Ban Chiang was discovered in 1966 by accident by Stephen Young son of former US Ambassador to Thailand. While on a field trip in sociological studies, Young stumbled on an old pot in Ban Chiang. After close examination of the pot, the site was excavated. Human skeletons, ceramics, and bronze tools dating back thousands of years were discovered. These priceless artefacts are on display at the Chumbhot-Pantip Arts Center, the latest addition to the palace museum in 1993. The ﻿Ban Chiang Archaeological site in Udon Thani 550 km from Bangkok, was designated an UN World Heritage Site in 1992. If you don't have time to go there, you can admire the artefacts at Suan Pakkad and marvel at a civilization that existed more than 5,000 years ago. The Ban Chiang Collection is a legacy of an ancient civilization in northeastern Thailand and a heritage to Thailand and the rest of the world. 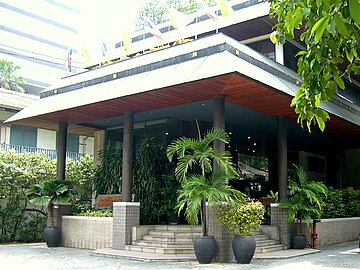 The other place in Bangkok where the Ban Chiang artefacts can be viewed is at is the Krom Luang Vorasd Thasuda Residence in Dusit Garden. After viewing the Ban Chiang collection, take a sequential tour of the eight houses which contain a rich collection of family heirlooms, paintings, ceramics and old weapons. House 1 - displays ancient muskets, swords, spears, 14th – 16th C pottery, paintings from the Ayutthya period 17th – 18th C and stone Khmer sculptures. House 3 – displays the famous Benjarong porcelain in the five principal colors, black, white, red, green, and yellow. Benjarong, in Thai, is the collective name for these five colors. This porcelain was popular with Thai royalty in early Bangkok 19th – 20th C.
House 4 – is a spacious formal dining and reception area with an altar room housing a collection of Buddha statues. 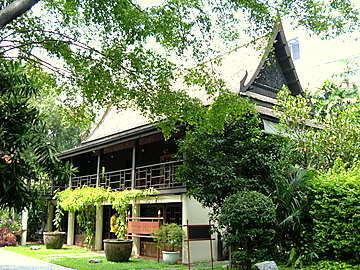 House 5 – holds a collection of old Udon Thani pottery, beads, bracelets, necklaces. 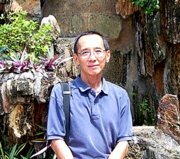 Udon Thani is the province where Ban Chiang is located. House 6 – is the Khon Museum displaying elaborately carved figurines of the traditional Thai Khon dance based on the Thai Ramakien which was adapted from the Hindu Ramayana epic. House 7 – has a rare collection of ceramic ware from the Sukhotai era, 13th 14th C and the Suan, Yuan and Ming dynasties in China. House 8 – displays silver, porcelain and crystal ware household utensils used by Prince Chumbhot. 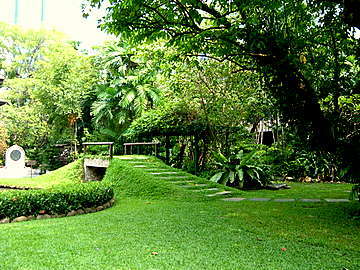 The garden in palace grounds is a peaceful respite from the busy city beyond the wooden walls. Stroll through the well-kept lawn with its lush greenery to the sounds of chirping birds and flowing water in the garden pond. Next proceed to the Lacquer Pavilion which is a separate house with beautifully lacquered murals and elaborately carved wooden panels. This was originally an old 17th century house from Ayutthaya which was dismantled, rebuilt and painstakingly restored in Suan Pakkad in 1959 as a birthday present from Prince Chumbhot to his wife. The last stop in the tour of Suan Pakkad is the Royal Barge Kao Kung Bayam a family heirloom used in the royal barge procession during the reign of King Rama V or King Chulalongkorn. The Suan Pakkad Palace Museum is a legacy of royal family heirlooms and priceless national treasures preserved for posterity. A convenient way of getting there is by skytrain to the N2 Phaya Thai station on Phaya Thai Road. Turn right into Sri Ayutthaya Road past the Florida Hotel at the junction. The museum is about 300 m from the junction. Opening hours are daily 9:00 am – 4:00 pm. Admission fee is 100 baht.